Bathroom Jack and Jill Ideas – Designing a Jack and Jill bathroom can be tricky. Even though it is designed as a shared bathroom, it still must have a personal space for the users to place their bathroom stuff. It is impossible, not to mention very weird, to have two bathtubs or toilet in a bathroom, but you can put two sinks there. 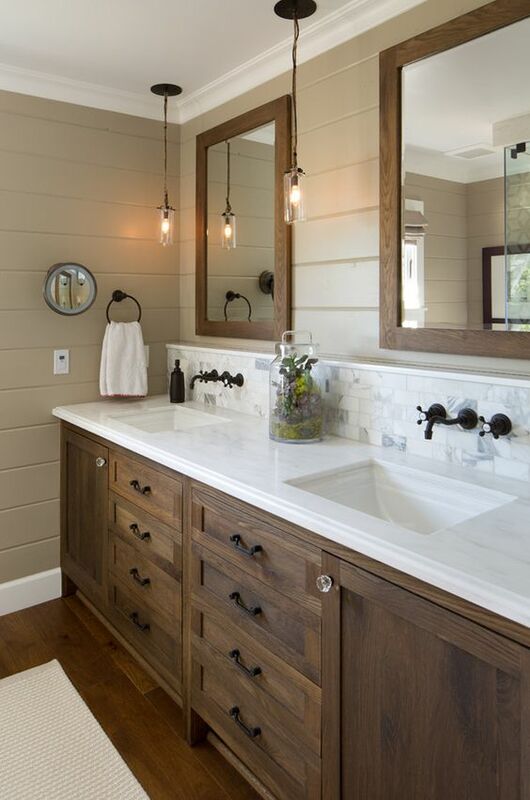 As long as you can design it well, your bathroom will not look out of place even if it has two sinks. 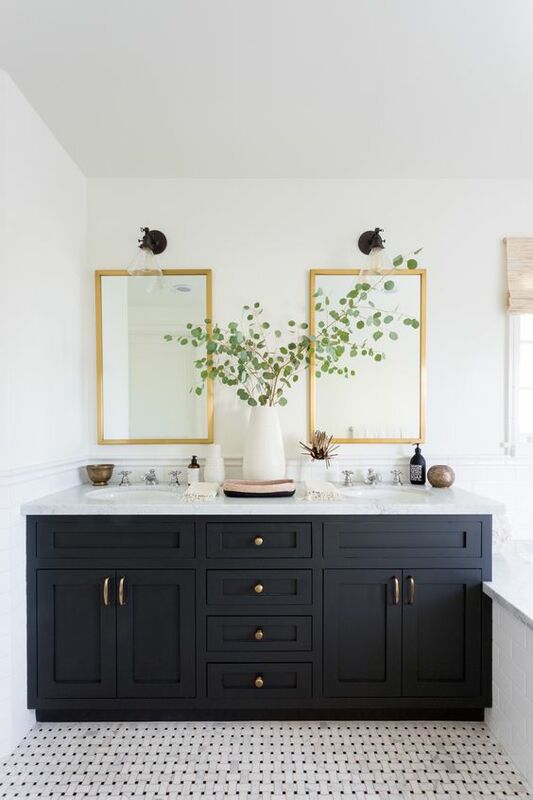 Black cabinet is a nice and simple way to house the two sinks. The symmetrical cabinet ensures everyone has the same amount of storage for their stuff. 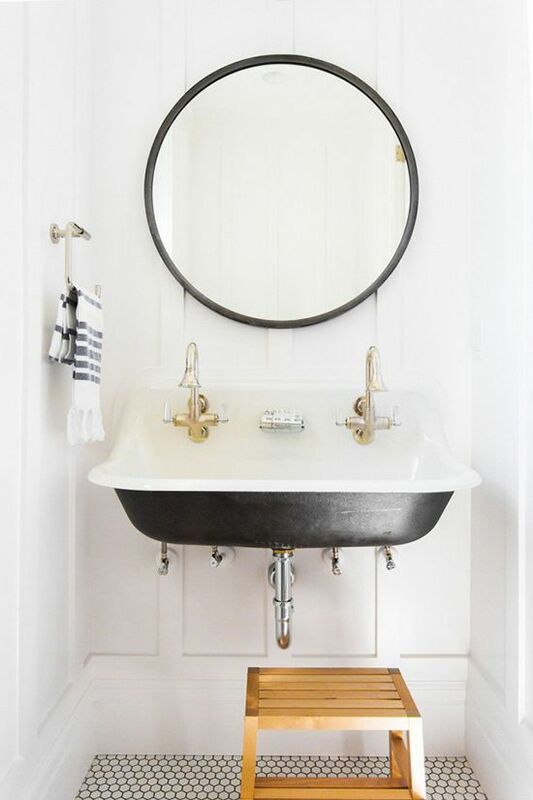 Black will also be a nice contrast in an all-white bathroom. 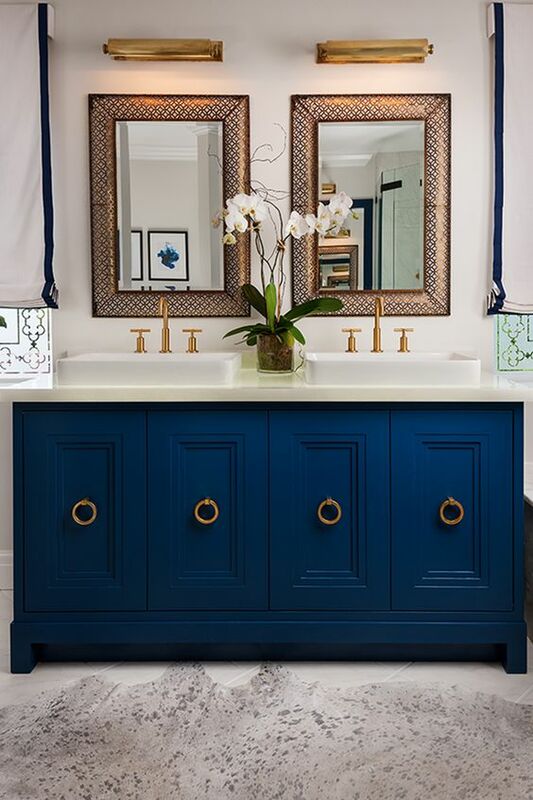 Put two matching mirrors with elegant golden frame to accompany the double sink arrangements. You can put a pretty plant vase in the middle of the cabinet, not only as a partition between the sinks, but also as an extra decoration. Jack and Jill bathroom is not only reserved for kids’ bedroom. Guest bedrooms and even master bedroom also can feel the advantage of this useful bathroom. If the bathroom is used by adults, just make sure that it is designed elegantly. You can use a classic wooden cabinet with marble countertops and undermount sink. 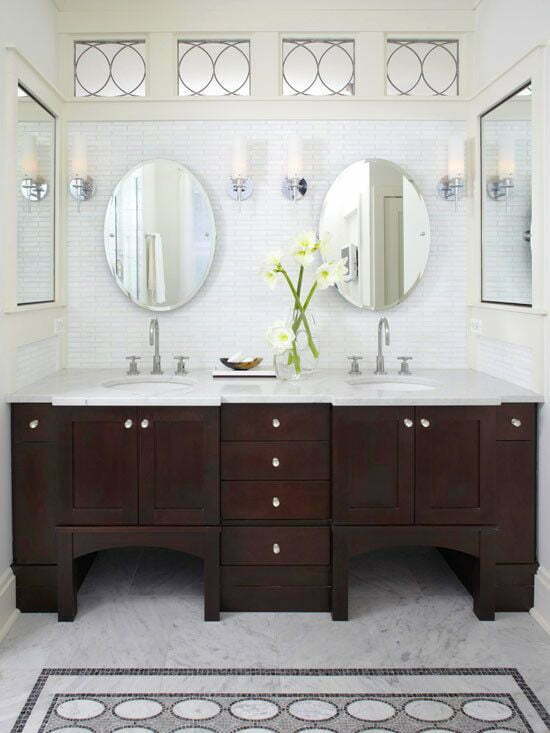 Match the mirror frame with the cabinet for a visual harmony. Choose opened floating shelves to create more unique atmosphere and make the bathroom feels airier. 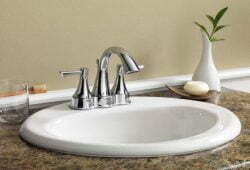 Vessel sink is the best match for the shelves, but make sure to stay simple so the design will not be too overwhelming. Use one big mirror instead of two smaller ones, which will be perfect to create unity. Instead of frame, the mirror will pop more with some beautiful lighting behind it. 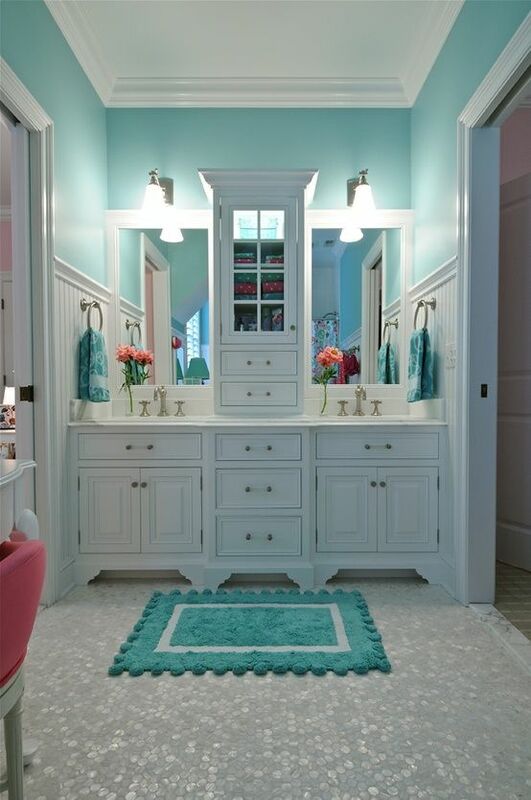 Don’t be afraid to use some colors to beautify your bathroom. 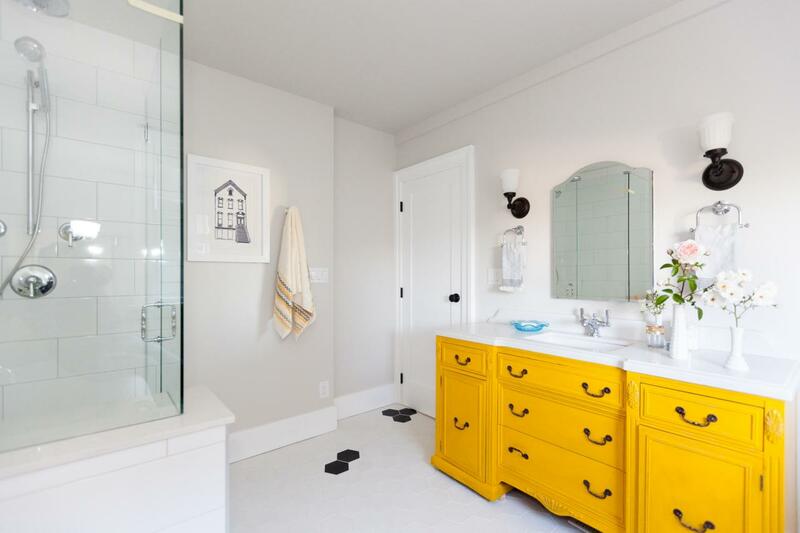 This beautiful bright bathroom is dominated by white, making the yellow cabinets become the center of attention. 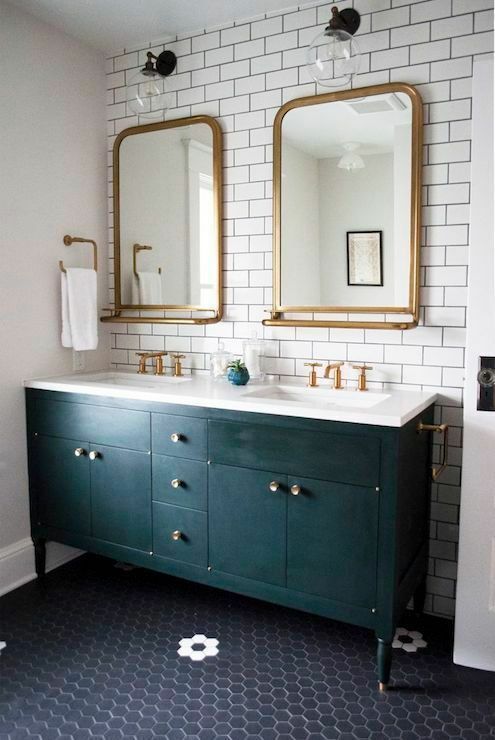 The simple undermount sinks, faucets and mirrors really make the mustard color pops. 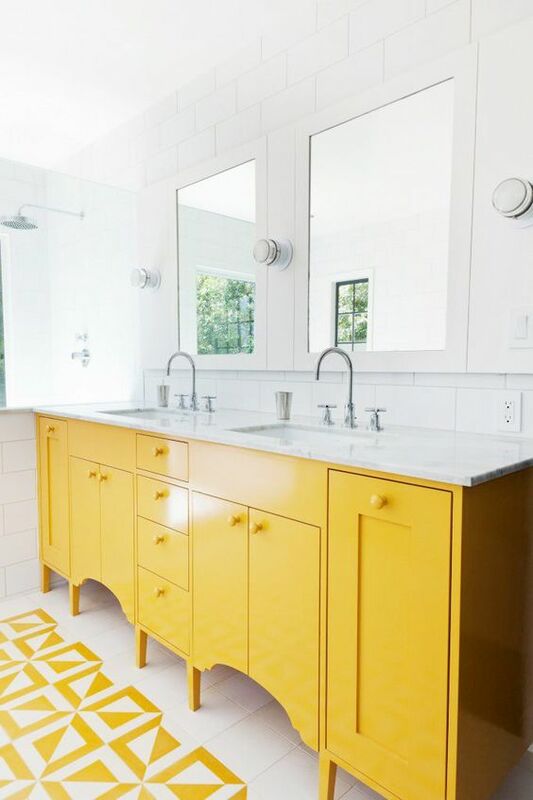 The yellow tiles with unique pattern becomes a perfect complement for the vivid colored cabinets. If you are craving for a little bit of personal space in the shared bathroom, don’t hesitate to use separate sinks. 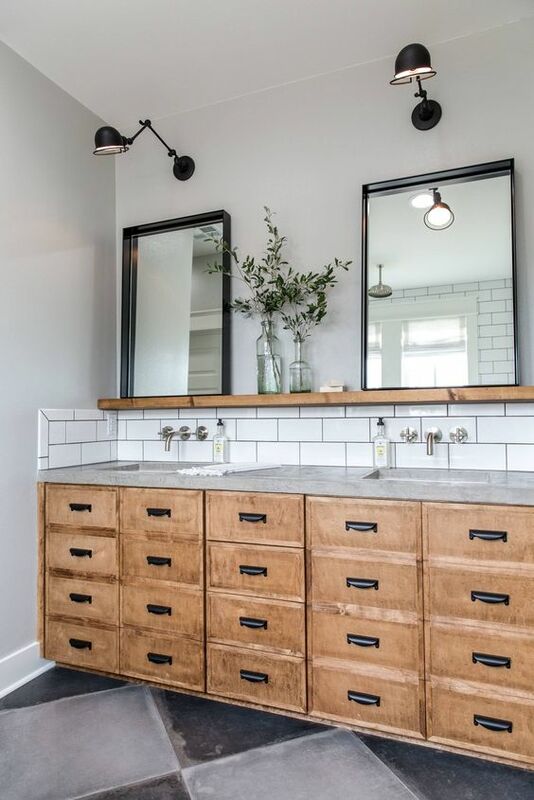 The sinks in this bathroom are put in twinning rustic opened cabinets. The cabinet is very simple with only single shelf, giving a more industrial look to the bathroom. The frames of the mirrors are similar with the style and material of the cabinets. With the addition of the small lamps beside the mirrors, the area looks even more attractive. Jack and Jill bathroom normally has two sinks. 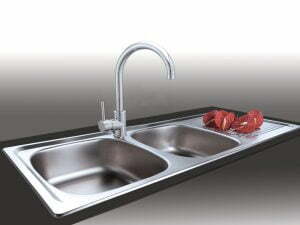 But if your bathroom is very small and it can only accommodate one sink, then there is nothing wrong with that. Even with only one sink, you can still install two faucets. This way, somehow the bathroom still has a personal space for the users. Since there is not much room for decoration, use round mirror instead of the rectangular one which is too simplistic for this bahroom. Floating cabinet is always a great idea for small bathroom because it makes the room less cramped. 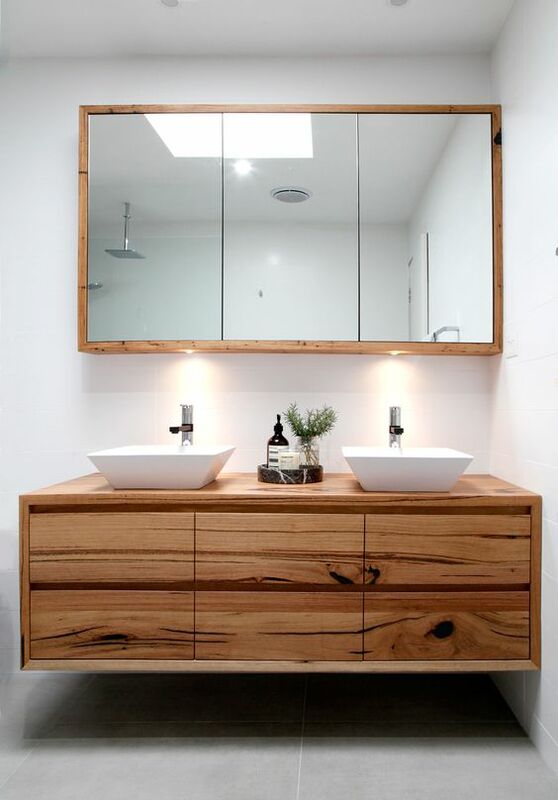 Floating wooden cabinet makes the room feels very serene and clean, especially with the presence of the unique shaped vessel sink. 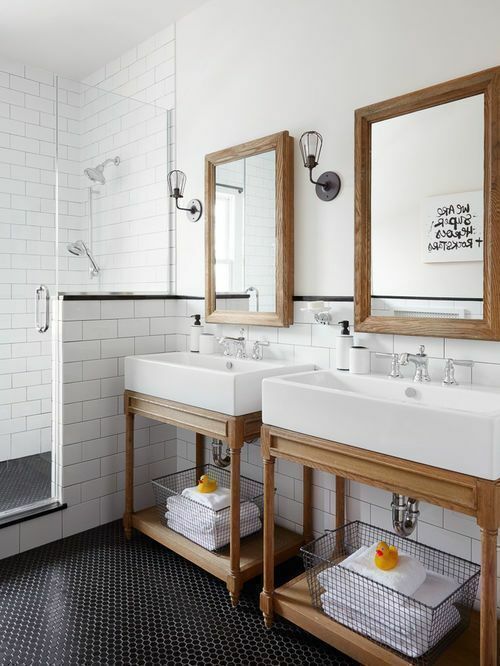 The bathroom looks very traditional but also modern at the same time. Instead of the usual mirror, you can install another overhead cabinet with mirror door. It is beautiful and also very functional at the same time. 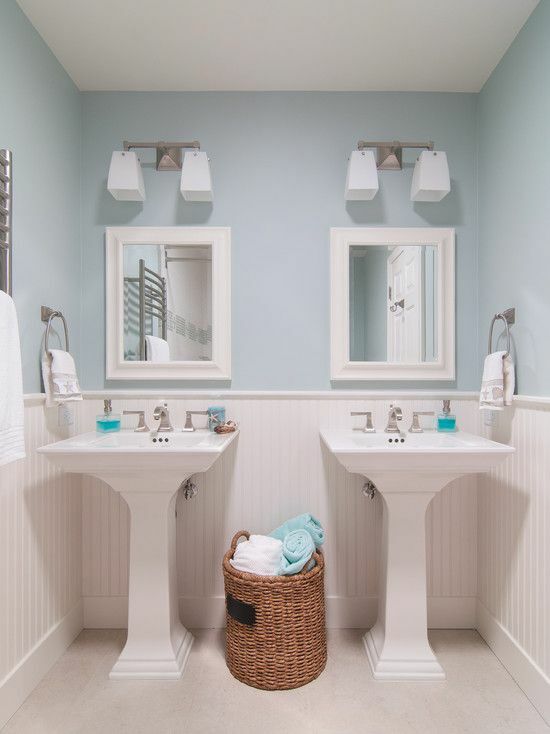 Bathroom is the perfect place to apply nautical color and this bathroom is the perfect example for that. To create more privacy for each user, an additional cabinet is installed between the mirrors. 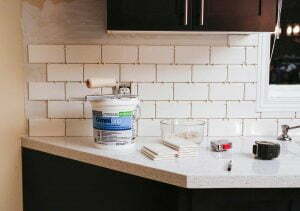 The slightly distressed white cabinet matches well with the nautical color. 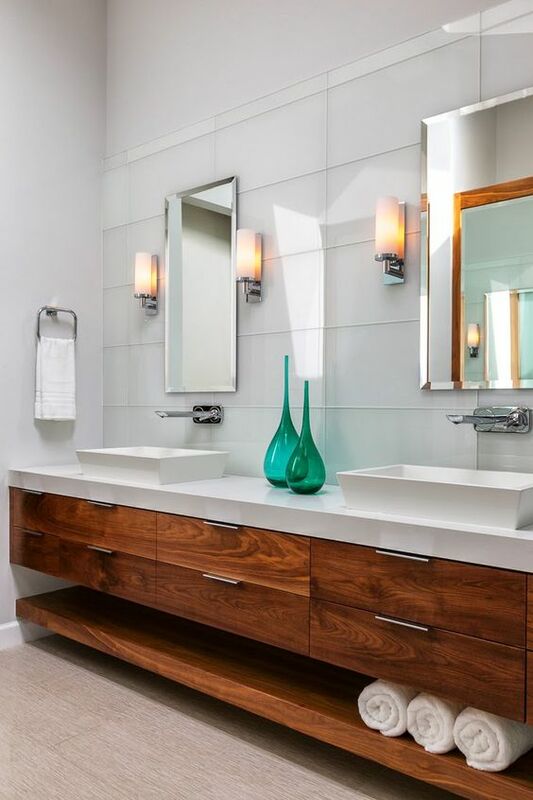 Furthermore, the beautiful shape of the wall lamp above the mirrors add more warmth inside the bathroom. Rug is not always a great idea for a bathroom, but the color combination and the choice of the furniture makes it work in this room. 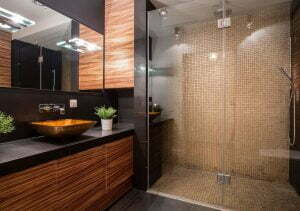 Black cabinet is a huge trend in modern bathroom. It is simple, elegant and can easily complement any styles. In this bathroom, the black cabinet is combined with contrasting white sinks and also brick styled white tiles as the background. The unique shaped mirrors with brass frame are the centrepiece of the room. The addition of huge lamp walls above the mirrors bring even more attention to the whole arrangement. Large sink might seem like a blessing. But if you fail to design it well, it will just look empty. The sink in this bathroom is big but not empty thanks to the clever arrangement of the mirrors and faucets as well as the design of the cabinet. 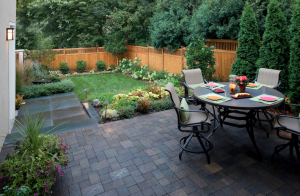 The combination of dark and neutral color also creates a perfect harmony here. 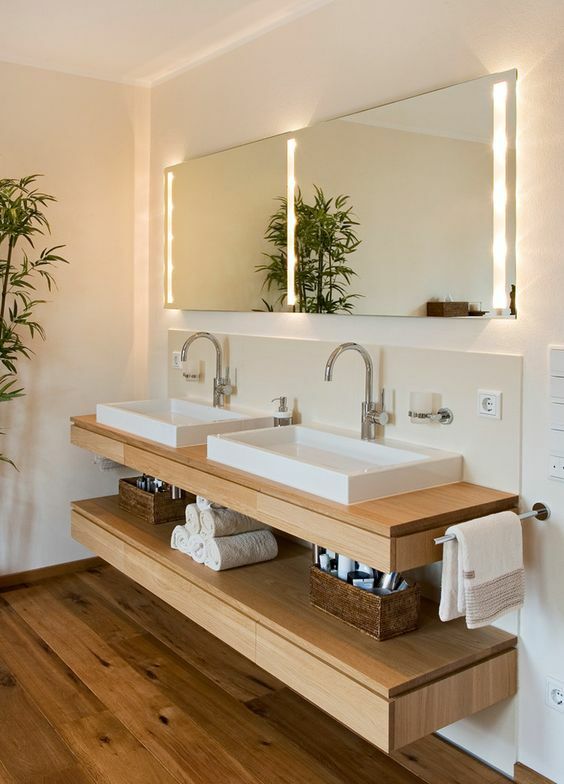 The sinks look very simple and the cabinet is also minimalist and classic. But somehow, the design still stands out thanks to the perfect choice of mirrors. 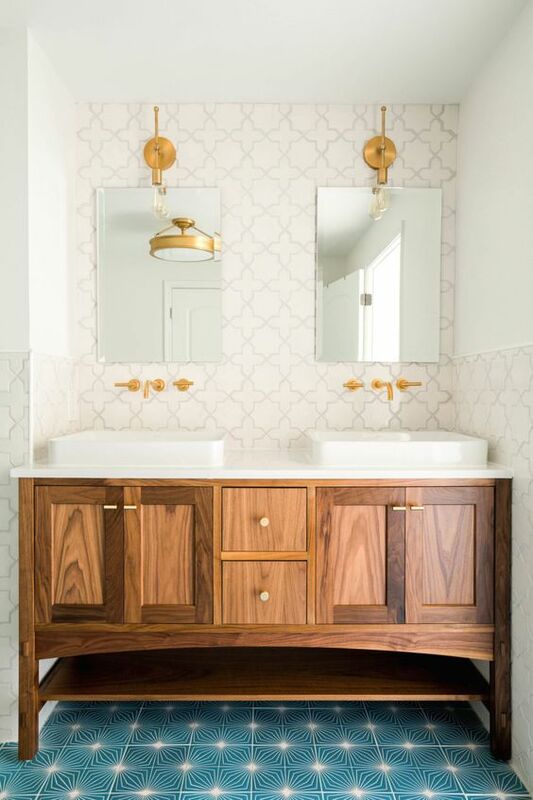 The floating frameless oval mirrors put become the focal point of this Jack and Jill sink. They are also perfectly complemented by the accents on top of the mirror, beautiful choices of wall lamps and also the additional mirrors on the sides. This bathroom has a large sink and also plenty of storages. But even if the cabinets are equipped with lots of drawers, it still has clean-cut and simple atmosphere thanks to the undermount sink and also the subtle color palettes. The mirrors come with long shelves that connect the two mirrors together. To make more space for bathroom stuff, the vases are put on the mirror shelves instead of the vanity. Blue is the perfect choice to create luxurious bathroom. 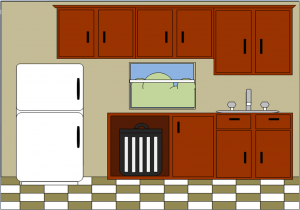 To create a direct statement, put the blue in the biggest furniture in the sink area, which is the cabinet. With a combination of golden and bronze in the door knob, faucets, mirrors and wall lamps. The magnificent atmosphere is very obvious. The beautiful flowers in the middle of the vanity create a nice distinction between the two sinks. Instead of sticking with one style, it is best to match various styles. Choose a variety of different wood grain for the cabinet to invite the rustic vice into the room. After that, add some majestic gold elements to complement the style and make the room looks fancier. Simply use the gold as an accent in the faucets or the lamps Starburst floor tiles will unite everything together and spice up your Jack and Jill bathroom.